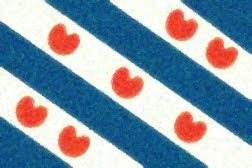 Fun With Frisian: BENIJD - "curious"
The word for this lesson is a common one in West Frisian, benijd, meaning "curious." Stress is on the second syllable which is said much like the word "night." The -d becomes devoiced (more of a -t). The first syllable takes a schwa. Buh-NIGHt. For those who are curious about the media merger situation with Omrop Fryslân, no final decision has yet been reached (the issue was up in the Senate at the beginning of February and then got delayed). We may hear more in March. Anyways, on to the uses of benijd. Ik is pronounced like the English "ick" and bin like the English "bin." This phrase is also the title of a TV show on the aforementioned Omrop Fryslân, one with shorts about culture in Friesland. Ik bin benijd wat er sizze sil. I am curious what he will say. Wy binne benijd nei jo/dyn/syn/har/it ferhaal. We are curious about your (formal)/your (informal) / his / her / the story. The words wy ("we") and nei ("to," "about") both take the -IGH sound like in "night" or "dye." Remember that the word it ("the") is pronounced with a schwa. UHt. Ferhaal begins with a schwa... the -r may get dropped. The second syllable takes a long "ah" as in "father." Fuh-HAHL.